It’s Sunday morning, and the families of your church are wanting to quickly drop off their kids into your kids ministry so they can get to the worship service. With everyone in a hurry, you may quickly find yourself sacrificing security for convenience. Don’t do it! Even though parents are rushing, your kids ministry could be the first to blame if a child is missing or hurt while in the care of your volunteers. These little guys are gifted escape artists, so be sure to have security gates/doors on all the areas in and out of the individual rooms and the preschool environment itself! Since big kids are better at staying inside a room they are dropped off in, stanchions are a great tool to use at your designated drop-off point. Be sure to have a volunteer posted at this location anytime kids are being dropped off or picked up. This helps to keep the kids safely inside the room and everyone else outside of the room. Why would you not want families to go inside the kids environment? You don’t know everyone. All your volunteers should be background checked to be sure it’s alright for them to serve in your ministry. When groups of people are going in and out of an area, it’s really easy for one of your kids already in your care, to escape un-noticed. This happened at a church where I was on staff. When the child’s parents arrived to pick her up, she was missing, and we were terrified! We eventually found her running around in the parking lot in the midst of moving cars. You know that wasn’t good. We were all thankful that she was ok -whew! Young preschoolers get upset when lots of people are going in and out of their room. If they see other little ones with their parents, it causes them to cry for their own mom or dad. What about visiting families or the parent that wants to stay with their child? Give visiting families a quick tour through the kids area. 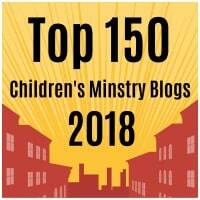 They can peek inside the nursery/preschool rooms, or walk into the back of the room in your large group elementary area as you answer their questions & tell them all about your awesome ministry. Let them know that all your volunteers have been pre-screened… that is why everyone is not allowed inside the rooms. If they would like to regularly be in the room with their child, let them know that you would be happy to add them to the volunteer schedule after they complete the necessary pre-screening requirements. Be ready to welcome families and have fun! Remember that your kids service actually begins when the first kid enters your #kidmin world, so be sure that your team is in place and FUN things are happening! You can have interactive videos on screen, pre-service game time, or activity stations set up around the room. If nothing is going on, parents may be leery of leaving their child with you… and the child may choose not to stay because nothing fun seems to be happening. What does your drop-off look like? Leave your comments below! This is the first in a series of how to have a secure environment for kids so their families can safely stop, drop off their kids, and run to worship service!